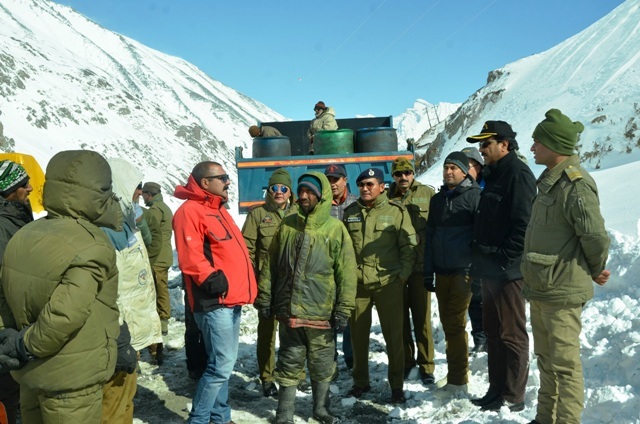 Kargil,November 06 (Scoop News)-Chairman and Chief Executive Councilor LAHDC Kargil, Feroz Ahmed Khan today visited Shaitan Nallah Gumri and took stock of the snow clearance work on the Kargil Srinagar Road in the aftermath of the recent untimely snowfall. The CEC exhorted upon the divisional administration to redouble their efforts in providing all amenities to the people so that they do not suffer. The CEC impressed upon the officers to be proactive and ensure that every possible facility is provided to the masses. He also asked the district and sectoral officers to personally monitor the field functionaries so that the people don't face any inconvenience during winters.